A White-bellied Heron, one of the world’s critically endangered birds, was sighted feeding along the Kurichhu basin in Monggar for the first time on October 9. The juvenile bird was spotted by a Park Range Officer of Phrumsengla National Park. The Royal Society for Protection of Nature (RSPN) confirmed the site as a new feeding habitat after observing the juvenile heron feeding there for more than two weeks. Conservationists say it is an indication that the birds are embracing new habitat, due to loss of their old habitat. “With the developmental activities going on in the current habitat along Punatsangchhu there is so much of disturbance, not only from the hydropower plants but also from natural disasters like forest fires,” Kinley Tenzin (PhD), the Executive Director of RSPN, said. Conservationists consider the White-bellied Heron an indicator species. Conserving the bird species and their habitat would mean conservation of several other plants and animal species in the forests where the birds roost and breed and in the river basins where they feed. “This bird is very important if you want to maintain eco-system dynamics. What happens is if the eco-system fails, then the whole economics, everything will collapse. I have been telling people that conservation is not only about saving tigers. All these flagship species and programs at the end of the day I think it is about saving humanity on this planet,” Kinley Tenzin (PhD) said. The RSPN with the Department of Forests and Park Services (DoFPS) have been working towards conserving the critically endangered bird species since 2003. 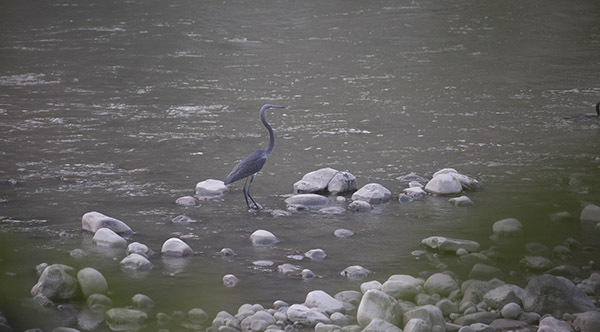 Some of the major conservation works include collaboration with the local community residing along the river basin and establishment of a captive breeding centre for the heron at Changchey in Tsirang, which is funded by the Punatsangchhu Hydropower Project Authority (PHPA). The White-bellied Heron is among the 50 rarest birds in the world. The global population of the endangered bird species has dropped to 50 of which Bhutan houses more than half of it. Bhutan is among the only three countries in the world that hosts the endangered bird species. As of today, there are 24 White-bellied Herons and five juveniles in the country, which is a decrease from 30 in 2016.